Chef Blythe Roberts has returned to head up the sessions at the Community Culinary School of Northwest Connecticut in New Milford. 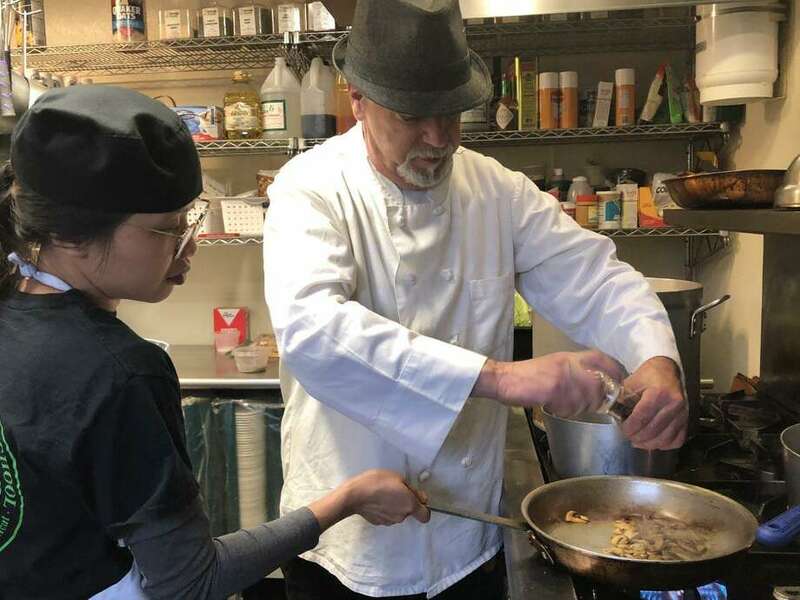 He is shown above with Anh Le of Kent, who came to the U.S. from Vietnam eight months ago, as she makes chicken marsala sauce. A familiar face has returned to the Community Culinary School of Northwest Connecticut in New Milford. Chef Blythe Roberts recently assumed the position as chef instructor, a position he held from the school’s inception in 2007 through mid-2016. The school offers culinary training and job placement to unemployed and underemployed adults age 18 and over who are interested in starting a new career in the food service industry. Roberts stepped away for a year and a half to pursue an opportunity in a restaurant and country club; Justin Elander, a 2009 graduate of the school, followed as chef instructor. “I always missed teaching,” Roberts said. Having had some time away to get recharged and reflect on how he had helped inspire individuals for several years at the school reinforced his decision to say “yes” when Dawn Hammacott, the school’s executive director, asked him to return after Elander sought another opportunity. “It’s been a great experience (working here), and hopefully as good of an experience for the students,” Roberts said of his years at the school. Founded in 2007 by Peg Molina and Hammacott, the school teaches students life skills and skills necessary for a career in the food service industry. A variety of topics, including professional techniques, food safety, nutrition, work habits and professionalism are among the topics addressed during each 12-week session that meets Mondays through Fridays from 9 a.m. to 3:30 p.m. at St. John’s Episcopal Church on Whittlesey Avenue. The next session begins Jan. 7. The school arranges for internships at area food establishments. Julie Elwood, a New Milford resident who graduated in 2017, completed her internship at New Milford Hospital. After, she gained more hands-on experience at a nursing home before becoming a cook a Maplewood at Stony Hill in Bethel. The school has a positive record thus far. It has graduated 278 students, including those who will graduate this week, on Friday. And it has a 96 percent job placement rate. Students have assumed jobs in health care, schools, hotels and restaurants. Many graduates have become chefs, including Mosca, who is a banquet chef at the Preston Barn at Old Drovers Inn in Dover Plains, N.Y. In addition to learning culinary and life skills at the school, the school is focused on the community. The meals students prepare are distributed to those in need through the town’s food bank. Since 2007, the school has provided 91,000 meals. “The students get hands-on experience, but they feel like they’re giving back,” Hammacott said of meal program. Community dinners — held in June, October, February and May — are another way the school taps into the heart of New Milford. “It started as a way to bring the community together, to break bread,” Hammacott explained, noting individuals can come with friends, make new friends or sit down with their family. Cooking classes for children 8 and older have also been offered. Eat Outside Day annually draws a crowd to the Village Green, too. Although it’s offered when the school is not in session, graduates return to assist with the special fundraiser day that provides boxed lunches for those who want to participate. “We are fortunate to have graduates who come back,” Hammacott said, noting many return regularly to support the school’s ongoing activities. Tuition for the culinary school is free for qualifying candidates. Eighty percent of students qualify for sponsorships, paid by the school. For more information, call the school at 203-512-5791 or email culinaryschool@sbcglobal.net.